Speak to Veldaban on the top floor of the Keldagrim Palace. You can begin this quest by speaking with King Veldaban on the top floor (the floor above the traders) of the Keldagrim palace. He says he plans on destroying the Red Axe once and for all and asks for your help, in which you should accept. He wants you to do three things: Interrogate suspected Red Axe spies, investigate and kill the chaos dwarves in Taverly Dungeon, and speak to the Watchtower Wizard in Yanille about the ogre's brain washing magic. He will give you a seal that will give you the authority to investigate such matters. The first step is to question the usual suspects. As waterboarding is not allowed by the Palace, you will have to do some old school questioning. The records chamber Veldaban speaks of is just west of the Black Guard Headquarters. 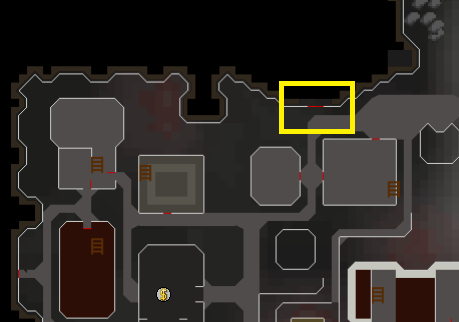 You should see a dungeon sign on the minimap right where there is an entrance in the wall. Enter it and you'll be in a room with the four dwarves you are supposed to interrogate. Speak to Lieutenant Brae and tell her that Veldaban sent you to question the dwarves. Speak to Brendt and Grundt, the two dwarves on the north/south ends of the room. After speaking with Grundt, you should notice clear discrepancies between Brendt and Grundt's story, such as the name of the ship's captain. Head back to Brendt and approach him with the inconsistencies. Following this, you will be given the choice to execute, exile, or free each dwarf. What option you choose should not matter. 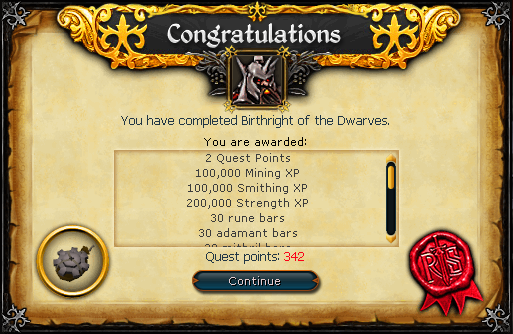 Now it is time to question the other dwarves. Speak with Klaas, who will deny any interaction with the Red Axe. He will mention the Red Axe inn and particularly a patron named Meike. Head to the inn southeast of the records chamber and speak to Meike. Ask her all of the available questions and head back to Klaas. Tell Klaas that Meike vouched for Klaas and you will again be given the option to execute him, exile him, or let him go. Finally, it is time to question Vigr. Vigr refuses to even speak to you until you get substantial evidence, so head to the northwest portion of the palace ground floor and search the furnace. You should find a bundle of letters. Read them and you will find out that Vigr was in contact with the Red Axe spymaster. Now return to Vigr in the records chamber and confront him about the letters. He will admit guilt and once again you will be given the option of executing him, exiling him, or releasing him. For this next part, you're going to have to fight a level 180 Mage weak to arrows. Bring some sort of ranging weapon (you should be able to get buy without an arrow based ranging weapon. Hand cannons are cheap, decent substitutes to a powerful bow). The mage also will frequently stun you, so put the freedom ability in your action bar. Head over to the Taverly Dungeon Chaos Dwarves (if you are unsure on how to get there, check out our Taverly Dungeon guide) and kill three chaos dwarves. After the three kills, a druid named Ikadia the Exile will appear. Ikadia will tell you to meet her (yes, Ikadia is a female) at the ritual area north of the chaos dwarves area, so walk north to the chaos druids circle and speak to her again. She will ask you if you are ready to fight for your dwarf king, and you should say yes. Ikadia will attack you just like a player. She will use abilities and you should be able to see her adrenaline bar. Despite her advanced level she is not very difficult. If you use the freedom ability whenever you get stunned and keep your hitpoints high, you should be fine. If you ever need to leave, simply run away. When you defeat her she will tell you a little bit about the chaos dwarves and she will oddly give you the option to kill her. Choose whichever choice you want, it does not affect the rest of the quest. Now it's time to find a cure to that Men in Black style memory swiping spell. Teleport to Yanille or the Watchtower itself and speak to the Watchtower Wizard (not one of the regular Wizards) on the top floor of the aforementioned watchtower. Tell him Veldaban sent you and tell him about the ogre. He says he will be able to make an anti-memory magic wand, but needs you to do some calibrating first. He will crawl into your foggy memories. Use your memory wand on an object and catch the memory fragments that come out (having run on greatly facilitates this). Now investigate the memory void to get a clue as to what the memory is. What would a gnome be doing here? :Gnome Emissary fragments. Once you have placed the fragments in the correct voids you will correctly recall your memory from The Forgettable Tales of a Drunken Dwarf. Following this, you should have a calibrated memory wand. Preparation: For this next part, you will have to face a massive cannon bombardment! With prayer you will be facing damage that hits 1/5 of your lifepoints! Bring high healing food and prayer potions. As the cannons hit you based on your maximum lifepoints, it may be a good idea to bring good, but not great, prayer boosting armour (such as initiate). A ring of life can come in handy here. You will also need a free inventory space. Now return to to Veldaban and tell him everything you have discovered. He will tell you to meet him at the Barendir Caves. 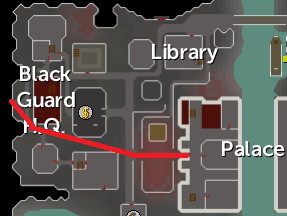 The quickest way to get there is to lodestone teleport to Relekka, walk to the Keldagrim Entrance, head east across the river with the dwarven boatmen, and enter the passage with a Black Guard member standing outside. From there, just head north through the passage. Once you are there, follow the path northward until you come across a cave. Enter it and you should see the black guard and trolls. Head to the north side and speak to King Veldaban. Now speak to Nulidon, who will tell you what you need to disable the Red Axe cannons and will give you five stackable explosive gears to do the job. Fire the dwarf cannon into the Red Axe compound and you will see the black guard break through with you leading the way! Yeeehawww! And that's where the fun ends since now you will be facing the toughest artillery seen since the Battle of the Bulge. If you haven't already, put on protect from range and run to the west. You should see a pillar near the lava (pictured below). Stand to the southwest of the pillar and let the cannons fire at you. They will hit the pillar instead, causing the it to collapse across the lava. Cross the pillar, run east, and sabotage the cannons on the other side. When you place an explosive gear in the cannon, do not wait around for the cannon to explode! Leave the immediate area, otherwise you will take massive damage when the cannon blows up. Also watch out for the boilers, which can damage you if they are hit and you are nearby. When you are done with the two cannons here, find the pillar around the westernmost cannon and stand southeast of it until it collapses. Now cross the pillar and deal with the cannon nearby and the two northernmost cannons. Besides that, keep your hitpoints high because they can extinguish you quickly and keep thinking good thoughts (at least they are dwarf cannons and not giant cannons!). If you happen to die your grave will appear en route to the cannon area, however you will lose all progress you made. Eight coloured segments on a flag: Standard fragments. Guthix won't help us now: Chaplain fragments. He doesn't want to be here: Conscript fragments. 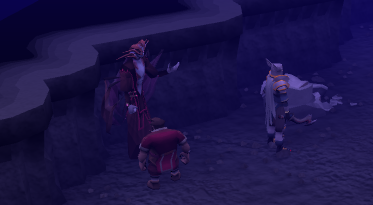 Now you will move onto a memory where Hreidmar speaks with Zamorak. I wonder where he got that scar: Grimsson fragments. Following this, you will be given the option of letting Grunsh go or killing him (again, this is not an important choice). Enter the nearby doorway and head to the middle floor of the palace. You should see Red Axe directors and traders. Talk to one of the Red Axe traders and tell him that your friend (Veldaban) would like to join the Red Axe. The directors won't let him in until there is only one director left, so kill seven of the eight directors and speak to the surviving director who will make Veldaban a member. Head upstairs and speak with Grimsson and Hreidmar. Go through the conversation until Grimsson begins to fight. Now you should teleport out and stock up for a fight. In this part you will have to fight both Grimsson and Hreidmar, both of whom melee. Thus, you should use magic attacks. The guidewriters recommend that you use blood/ice blitz/barrage and soul split if possible. 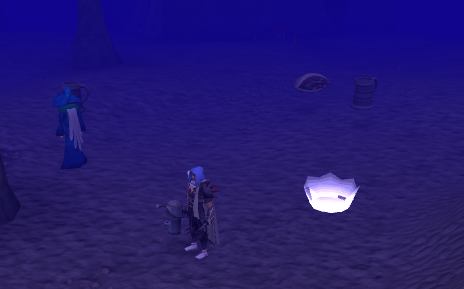 Along with this, bring some potions, a ring of life and/or a one click teleport. To get back to the Red Axe area, follow the route back to the Barendir caves and you should end up right where you left off. Grimsson will begin attacking Veldaban. If you let Veldaban die, you will have to start over again. Attack Grimsson as quickly as you can. He won't attack or hit you much, but has 50,000 life points. At first, the only time he will hit you is when he will is during a special attack where he throws Veldaban at you. To avoid this, you can stand behind a pillar and force Grimsson to throw Veldaban elsewhere. However Veldaban will still take 7500 damage, and as you are trying to keep Veldaban alive this is important. When Grimsson throws Veldaban he should come after you. When this occurs, lure Grimsson out of the throne room. 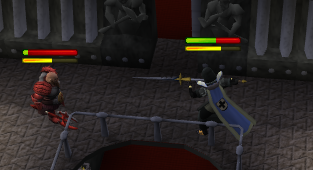 If you are using ice spells, try to farcast him and tank out his limited range attacks (as shown below). If not, tank out his melee attacks and try to avoid them if possible by using stuns. When you kill Grimsson, Hreidmar will cast a chaos spelling turning both Grimsson and Hreidmar into powerful chaos versions of themselves! This Grimsson is much tougher than before being level 160 and 60,000 life points. Hreidmar will also summon cannoneers to make your life a bit miserable. However, for this fight you can avoid this by luring Grimsson out of the throne room (similar to what do you did before) and closing the door on Hreidmar. If you do this incorrectly and Hreidmar begins summoning cannoneers, teleport out and try again or simply try to tank the damage. Attack Grimsson similarly to his first form, however when you see the message in your chatbox that he is about to charge run down the stairs, wait around 10 seconds, and head back up. Once Grimsson is defeated, you'll have to face Hreidmar. Unless you think you can make a go at it, teleport out and restock. For the next fight, you can either stick with magic or switch to range. It shouldn't matter how you trap Hreidmar (it can be behind any lamp or possibly the throne room), however he can only be two or three spaces away from you. As you can probably tell from the picture, you can also trap minions behind objects as well. Now kill all minions that are not trapped but do not leave your current space. Now it is time to take care of Hreidmar. It is essential to take as few hits as you can from Hreidmar, so turn on momentum and quickly hit Hreidmar with an attack. Once you are done, move back to your starting point ASAP, otherwise Hreidmar's adrenaline will increase. Hreidmar never leaves his combat position, thus his adrenaline will not decrease over time even if yours does. However, if you do the attack and step back quickly enough you won't have to take any hits and hence face no abilities. If Hreidmar manages to teleport to a different location (such as switch places with the cannoner in the above picture), you will have to get closer to him again or else this will fail. If Hreidmar summons any more minions that cannot trapped without leaving your current position, kill them (preferably with abilities), switch back to momentum, and continue. Keep doing this until Hreidmar is dead. This may take several tries. Once Hreidmar is defeated, speak to Veldaban inside. He will be fighting the chaos inducing spell Hreidmar cast. You will be given the choice as to whether you want to kill Veldaban or keep him alive. 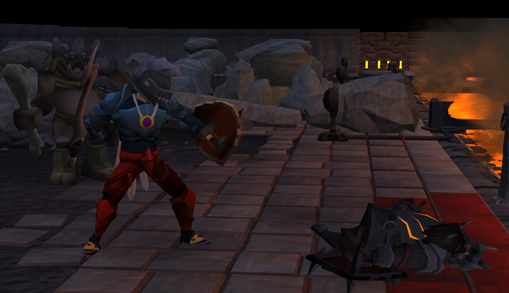 You will then see a cutscene where the dwarves and trolls unite to bring down the Red Axe statue. If you chose to keep Veldaban alive, you will see a consotorium meeting where the directors ask Veldaban to step down as king! You can either choose for Veldaban to stay king or to step down. Once you have decided that, speak with any of the directors to complete the quest. 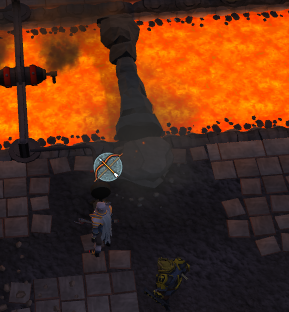 After this quest you will unlock a new Lava Flow Mine random event called the Lava Geyser. To complete this random event, cool off the geysers with water or ice spells and then mine them. From this you can gain the four Imcando Pickaxe pieces. When you have all four pieces, take the pieces, a gilded dragon pickaxe (obtained after getting each golden mining piece from a golden nymph at the Lava Flow Mine and then getting the golden nymph random event again), one million gold pieces, and a redberry pie to Thurgo near Mudskipper point, who will give you an Imcando Pickaxe. Thurgo will take a gilded Dragon Pickaxe from your toolbelt. The Imcando Pickaxe itself cannot be added to the toolbelt. The Imcando Pickaxe is not faster than the Dragon Pickaxe but will incinerate 25% of the ores you mine, leaving you with smithing experience. The Imcando Pickaxe can also be enchanted for 20% bonus experience, but only has 100 charges before you need to recharge it on a lava geyser. If you have 95 mining, you can mine dwarven rubble and statues in northwest Keldagrim. You can only do this once, but you will receive 230,000 experience for around a minute's worth of work. You will also learn interesting information about the rise of the Chaos Dwarves. If you do not have 95 mining you should come back when you do.